Legend has it that many, many years ago there was a wizard who had always wanted to fly like a bird to see what it felt like to soar through the air. Arion, for that was the wizard’s name, hoped that one day he would finally manage to fly, so every day as soon as he got up he would set to work in his laboratory searching for the magic formula. One day, as the wizard was doing his experiments and inventing new potions, his cat Dabra arrived in the laboratory. He was so happy to see the wizard that in his haste he broke into a run and knocked over some of the potions Arion had made. The wizard got very annoyed with Dabra and said: “Naughty cat!! I don’t want to see you ever again, get out of this house! !” And so Dabra went sadly out onto the street. 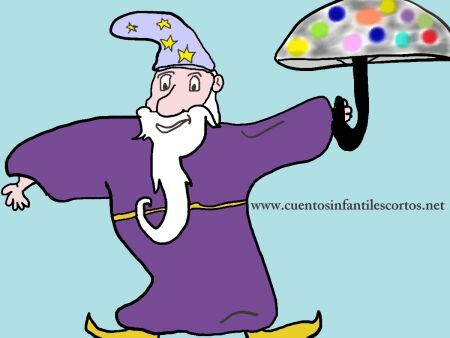 But just as Arion the wizard was about to throw the umbrella in the bin, he accidentally opened it up and saw a blaze of colourful lights surrounding him. And then he noticed that his feet weren’t touching the floor – they were in the air! The wizard spent the whole afternoon flying about from one place to another and having a grand old time. But as he glided near his house, he noticed Dabra curled up on the ground outside, weeping because his master had been angry with him. So Arion the wizard flew to earth, shut his umbrella and went up to his cat. “Dabra! I’m very sorry, dear friend, for being so horrible to you. I know that all you wanted was to say hello and that you didn’t realise that the potions were there. Come home with me and I promise it will never happen again. I’m very sorry for having treated you that way,” apologised Arion the wizard in remorse. For after all, the wizard had achieved his wish to fly like a bird thanks to his cat Dabra, who had accidentally mixed up all the potions to create a flying umbrella. And Arion the wizard understood that he should never treat his dear cat Dabra so horribly ever again.